This chapter provides detailed outlines for the effective communication of clinical and forensic findings as they relate to Miranda issues. Readers will learn to write thorough, well-balanced reports that can guide criminal attorneys step-by-step through sometimes intricate findings. As discussed in Chap. 2, legal strategies may extend far beyond suppression issues per se and factor relevantly into other aspects of the case. 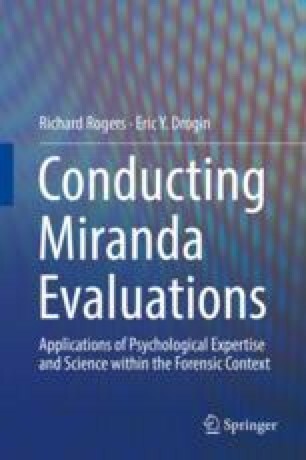 Thus, cases may often be encountered with mixed findings concerning Miranda comprehension and reasoning, but such findings may still relevant to retaining counsel. Beyond communication to courts and attorneys, Miranda reports are intended to serve as a practical template to be used in preparing for expert testimony in a suppression hearing. The care and thoroughness of the Miranda report will signal to counsel on both sides the value and substance of the forensic practitioner’s conclusions. Based on such attributes, the suppression hearing may sometimes be averted via by a mutually advantageous plea bargain. Regarding testimony, this chapter provides constructive guidelines for building the direct examination in order to present persuasive and coherent themes to the trial court. For cross-examination, the chapter anticipates challenges and vulnerabilities that may be encountered during the suppression hearing.